Attempts a fine balance, but topples ever so slightly at both beginning and end. I had this 40% seventy-dollar Colombian rum after a fiery Indian food-fest served by the January Liquorature host who had selected Rohinton Mistry’s epic book, and really, what was I thinking? – the fiery heat muffled and deadened the taste buds…but it says a lot for Dictador that even under the assault of such tongue-numbing spices, I was still able to appreciate it. And after coming home, I tried it on and off over the next week just to nail down the nuances. Coffee. Yeah, that’s what the nose led in from, immediately, like Juan Valdez was tapping me on my shoulder: not aggressively so, just…making hisself felt. Hola, amigo. Que tal? The overall balance between this cafe and the brown sugar, toffee, nougat and cinnamon was impressive as all get-out, because what you got was a subtle melody enhanced by additional notes that supported and defined it without overwhelming the thing. Note this, however: I gave it to my snub-snooted and far-too-clever son to sniff, and he pointed out an oddly discordant, and very faint rubbery note, not enough to spoil anything, but sufficient to throw me off. Plus it was smooth and heated (just enough), and though I have gone on record as getting somewhat snooty about 40% rums, here I think that strength was just right. 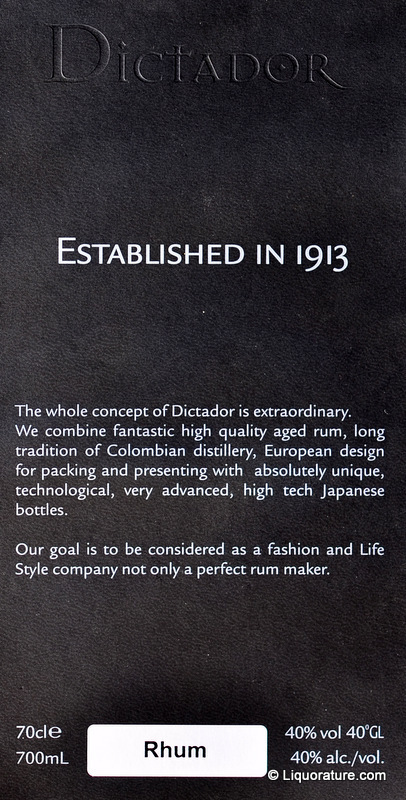 This is largely because the Dictador 20 is a solera, and made from (rather confusingly named) “sugar cane honey,” according to their website. Sugar cane honey is simply the rendered down juice resulting from pressing the cane, but with sexier, warmer connotations, mostly marketing-derived. Soleras, at least from the several I have tried, are also a bit smoother and sweeter than the norm, hence the perennial favouritism shown to Zacapa 23, Rum Nation 15 and others of their ilk. I’m not sure that making them stronger wouldn’t shred some of their underlying structural frailty – they are bottled at pretty much the correct strength for what they are, I think, though you can take that as just my opinion. Here it worked swimmingly. The profile was quite professionally workmanlike: unlike the Juan Santos line, which hews to a more subtle palate that you have to work at to dissect, the Dictador was definitely a rum, a smooth and heated one, a shade astringent, just sweet enough (less than most soleras, more than most “standard” rums people mix or drink) and arriving with notes of caramel, some oak spice, nougat again, and nutmeg and cinnamon dusting around the edges. After I had let it rest for a bit, more earthy flavours came out – truffles, dark chocolate, unsweetened cocoa. Quite chewy and solid, actually, coating the tongue like an electric blanket with the voltage turned up. Not the most unusual or intriguing rum I’ve ever tried, no – but among the most solidly-crafted. The fade was perhaps this rum’s weakest point, short and generally lackluster, indolent without malice, leaving behind the memory of toffee, caramel notes, and a last flirt of licorice…but at least it didn’t try to maul me. 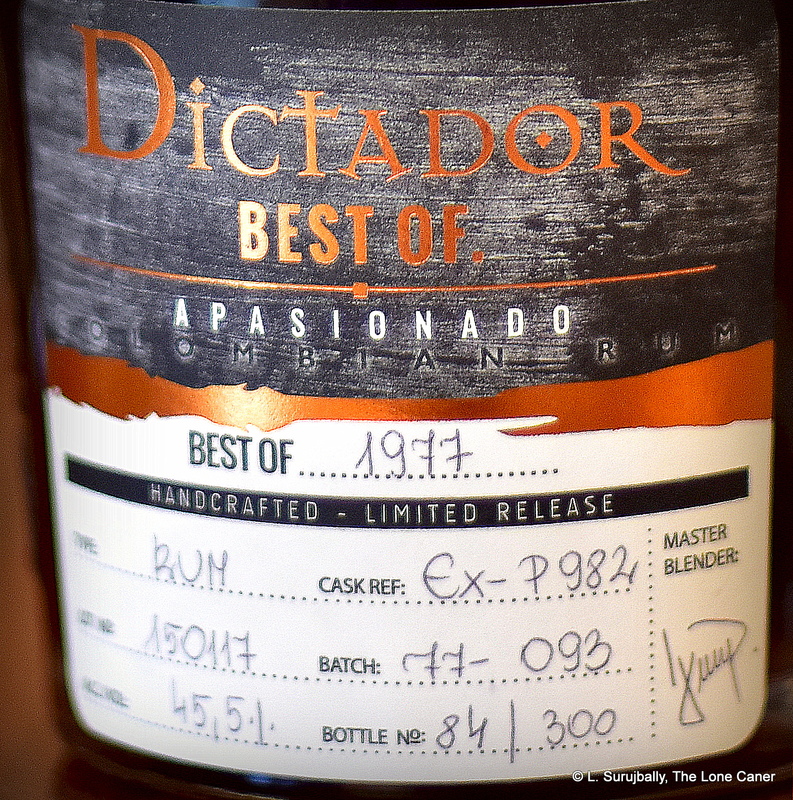 The Dictador line of rums includes the 12 (I keep seeing it floating around, but haven’t gotten around to buying it) as well as the XO “Insolent” and XO “Perpetual”, which at the least are intriguingly named…I might wan to try them just for those names alone. 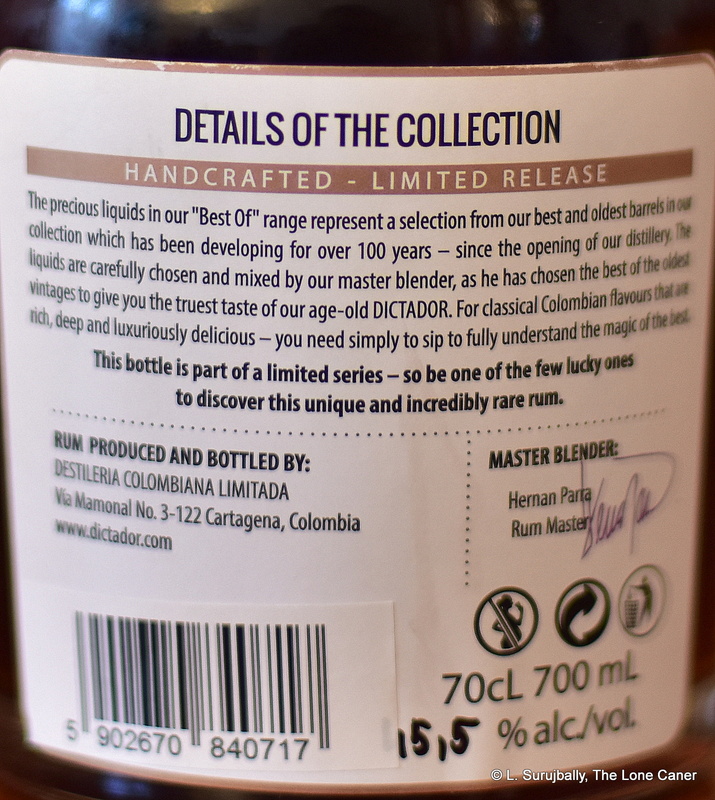 The line originates from the aforementioned “honey” which is then distilled partly in copper pot stills, and partly in continuous column stills, and then aged in oak barrels using the solera system – so what you are getting is a product where the oldest part of the blend is 20 years, not the youngest. I should note that I absolutely love the zen of the black bottle: very chic, very stark, impossible to miss on a shelf. 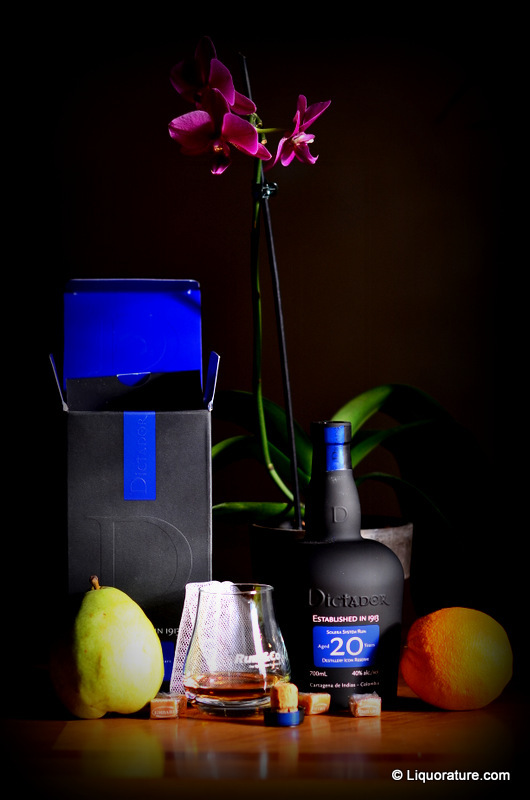 The Distileria Colombiana which produces it is located on the Caribbean coast of Colombia, at Cartagena de Indias, and was formed in 1913 by Don Julio Arango Y Ferro, whose ancestor (the eponymous Dictador) began commercial rum production in the 18th century. Overall, I like the Dictador, but can’t say I’m entirely won over by it. It’s a straightforward, unadventurous rum that takes itself more seriously than it should, and gains a lot of brownie points for cool presentation – now, I know I give points for appearance and “how it looks” (and have taken more flak than you would believe for that attitude), but, like with every pretty girl that ever worked with or for me, in any office for the last thirty years, here’s the bottom line: if you can’t do your job professionally and well, your appearance matters not a damn. 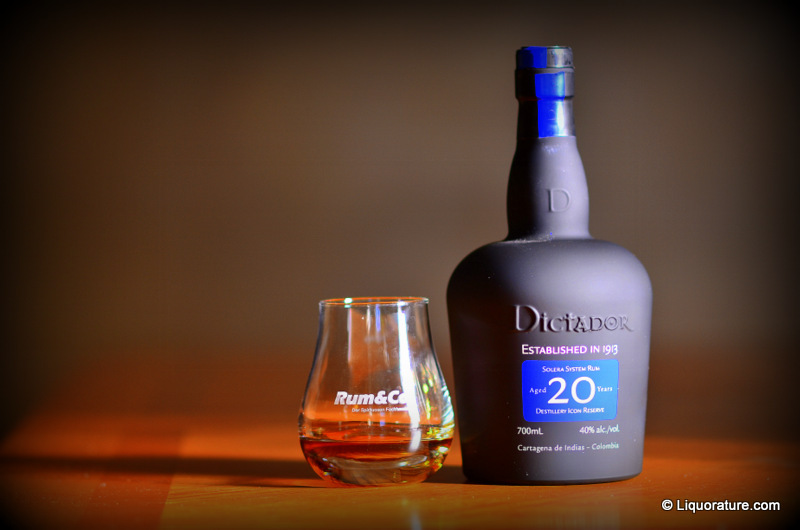 So, perhaps this is what it is: the Dictador 20 is not so much brilliant as simply, conservatively solid in its display of rum making fundamentals. It is a well made, well-tasting solera rum that somehow finds a reasonable harmony between its earthy maturity, and the the sweetness and sprightliness of youth, but which misses the boat in overall enjoyment (for me). 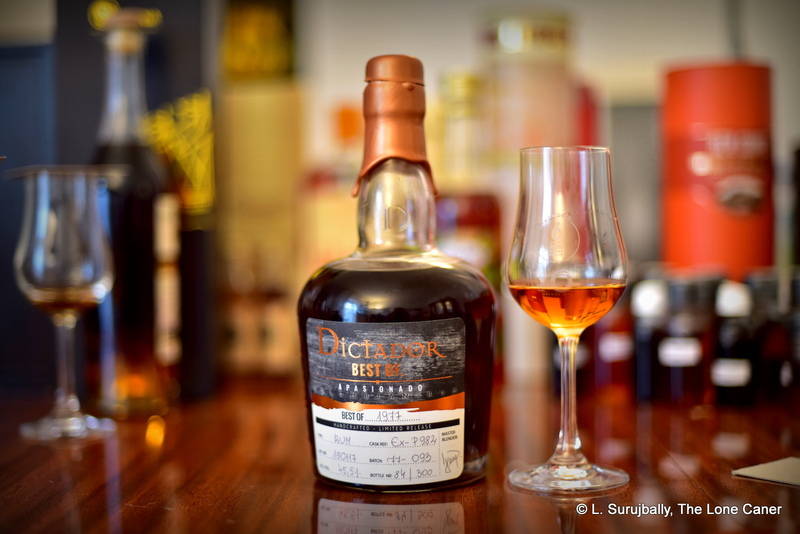 Over time, familiarity has made me move away from the better known Zacapa 23 and embrace slightly more unusual and less-familiar solera rums: the Dictador 20 may be neither unusual, nor less familiar, but that it is a decent, above-average rum to have on your shelf is beyond question. What a pity that this isn’t enough to eclipse the other soleras in my collection.